Most people think that Noah's ark came to rest somewhere on Mt. Ararat. Mt. Ararat, located in eastern Turkey, is near the borders of Iran and Armenia, as well as Iraq. Noah's Ark expeditions have fascinated archaeologists and explorers for hundreds of years, drawing many adventurers to the mountains of Ararat, the landing place of the ark as recorded in the book of Genesis. Yet after numerous expeditions, the true location of the ark remains a mystery. Many claim to have seen the ark, and some even say they have found and entered it, but none of the alleged witnesses have been able to produce unequivocal proof of the ark's existence or find their way back a second time. The stories often contradict each other as well, but they almost all agree that they saw Noah's ark on Mt. Ararat, located in eastern Turkey near the border with Armenia and Iran. Most searches for the ark have been conducted on Mt. Ararat. However, it should be noted that the Bible states that the ark landed "on the mountains of Ararat", denoting an entire mountain range rather than an individual mountain. The place known as the mountains of Ararat, thought to be the same as the ancient kingdom of Urutu, encompasses a broad area. Mt. Ararat is only one peak in this mountain range, but it is commonly believed to be the final resting place of the ark. Some claim that Mt. Ararat, the tallest mountain in the area, is the only one with a large enough ice cap to preserve the ark for thousands of years, while others point out that the volcanic mountain experiences frequent mudflows that would have destroyed the ark long ago. Additionally, some researchers are convinced that it is impossible for the ark to have landed on Mt. Ararat because the mountain was not in existence at the time of the flood but was actually formed much later as a result of volcanic activity. The discovery of Noah's ark would validate the Biblical story of Noah's flood. Noah's ark, if discovered and authenticated, would have a tremendous impact on the world and in particular the Bible-believing community. For some, the discovery would serve to reaffirm their faith in the Bible by validating the account of the Great Flood in Genesis. It would prove once again that the Bible is accurate and can be accepted as true. It would also convince many people that the worldwide flood, now relegated to the realm of myth, actually occurred. This in turn would challenge currently held ideas of uniformitarianism and the evolutionary view of the fossil record. If a boat as large as the ark were to be discovered on the summit of Mt. Ararat, it would point to a global flood large enough to float the boat to the top of the mountain. Other people groups would also be affected by such a discovery. Christianity is not the only religion to believe in Noah's flood; for example, the Islamic Qur'an also makes mention of Noah's ark and the Great Flood. Additionally, the country of Turkey as a whole would benefit from greatly increased tourism if Noah's ark was ever positively identified. While the discovery of Noah's ark may strengthen the Christian arguments for creation and a young earth, there will always be those who will deny the truth of the Bible. They would likely refuse to accept a discovered Noah's ark as genuine and, even if they did accept it, might protest that the ark could have been brought up to the mountain by other means and did not necessarily arrive atop the mountain by floating there during a worldwide flood. Mt. Ararat, located on Turkey's border with Armenia and Iran and near Iraq, is often at the center of political tension and regional turmoil. Kurdish terrorist groups live on the mountain, hiding out in caves and attacking groups that try to search for the ark. Many explorers report being shot at and harassed by the terrorists. The PKK (Kurdistan Workers Party) especially has been responsible for attacks on explorers. Since 1928 the group has been working to fight the Turkish government by attacking the tourist trade, and those who enter Mt. Ararat, where the PKK often hides out, come under attack. During the Cold War, Turkey shut off all access to the mountain because of its proximity to the Soviet Union. Searchers were suspected of spying under the guise of looking for the ark. 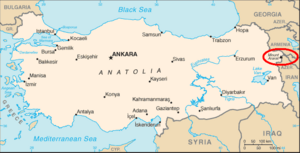 When the Cold War ended, the Turkish government began letting people enter and explore the area, but many locations are still restricted and expeditions often have to be postponed, cut short, or canceled altogether due to a lack of support from the government. In addition to political conflict, searchers also face natural dangers. Mt. Ararat, a volcanic mountain, last erupted in 1840, and today earthquakes, mudslides, rock slides, and avalanches threaten those who attempt to ascend the mountain. Explorers often look for the ark in crevasses and canyons such as the Ahora Gorge, but these locations are dangerous and several adventurers have lost their footing and fallen to their deaths in the deep cracks of the mountain. Weather can also prove treacherous, with storms, lightning, and thick fog, and explorers must watch out for wild animals such as wolves that roam the area. Many individuals and groups have been drawn to Ararat and the surrounding area in search of Noah's ark. The prospect of such a discovery has captivated audiences around the world for years. Some even claim to have seen and entered the ark, but, unfortunately, these claims remain largely unsubstantiated. Many of the claims seem far-fetched at best, causing people to doubt that the tales contain any truth at all. Indeed, since multiple groups claim to have discovered the ark at different sites, they cannot all be right, yet they continue to display their findings as being unequivocal evidence of the ark. Robert Cornuke describes the persistent insistence of searchers that theirs is the true Noah's ark as a result of "ark fever". He says that, "At its most severe, ark fever can cause otherwise sane people to see what they want to see--or expect to see--rather than what's really there. ".As of yet, no one has been able to produce conclusive proof that the ark has been discovered. 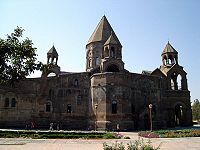 Friedrich Parrot stopped here, at the monastery at Echmiadzin, as well as at St. James's monastery. 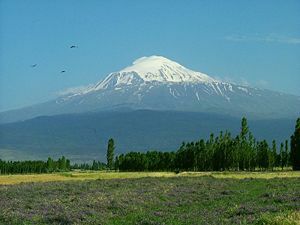 Friedrich Parrot traveled to Turkey in 1829 for the purpose of climbing Mr. Ararat. His party stopped first at the monastery at Echmiadzin, where they were joined by a deacon from the monastery, and next at St. James' monastery at the foot of the mountain. Parrot and his group made three attempts to climb the mountain, finally reaching the summit on the third ascent, which occurred on September 27, 1829. They erected two crosses in the ice, which they brought up the mountain from the monastery. Parrot saw no sign of Noah's ark, but traveled to the summit in order to disprove the belief of the Armenians in the area that it was impossible to reach the summit because God was protecting the ark there. This belief arose from the story of a monk named Jacob who attempted to reach the summit of Ararat. According to legend, Jacob would spend the day climbing but at night God would move him back to his starting point, so that he awoke no further than he had been at the beginning of the previous day. Finally, God sent an angel to the monk to tell him that no one would be allowed to reach the summit of Mt. Ararat. The angel also supposedly gave the monk a piece of the ark, which he brought back to the monastery at Echmiadzin as a relic. The St. James monastery was also said to have contained relics made from wood taken from Noah's ark. Sadly, the monastery was destroyed by the eruption of Mt. Ararat in 1840. Prince Nouri, the archdeacon of Babylon, visited Mt. Ararat in 1887 after hearing that it was the landing place of Noah's ark. On his third climbing attempt, he reached the summit of Mt. Ararat on April 25, 1887. There he found Noah's ark buried by rocks and ice. He returned home and, some years later, tried to raise enough support to bring the ark to the Chicago World's Fair in 1893. Unfortunately, before he could do so he was attacked, allegedly by the founders of a satanic church. The assault distraught him to the point of insanity and he died soon after of pneumonia in a mental hospital without ever disclosing the location of the ark. As the story goes, Vladimir Roskovitsky, a pilot in the Russian Air Force, spotted the ark from the air. Upon hearing Roskovitsky's report, the Russian czar ordered a group of his soldiers to form a ground expedition to visit Noah's ark. The Russian troops reportedly made a thorough investigation of the ark and took detailed measurements and photographs. However, on their way back to the czar the Russian Revolution broke out and all of the documents were lost, never to be recovered. This story first appeared in New Eden, a magazine, in 1940 and quickly spread. When asked for further details about the story, the editor directed everyone to his source, Benjamin Franklin Allen, who revealed that the story as it appeared in the magazine was almost all fiction except for the fact that some Russian pilots had reported possibly sighting the ark during World War I. In 1943, Sgt. Ed Davis became friends with his transport driver, a Kurdish man named Badi Abas, while stationed in Hamadan in northern Iran. One day, the man's grandfather visited Badi Abas and Davis at the military base and offered to take them to see Noah's ark, which had been exposed due to high temperatures that melted the ice concealing it. Davis later described the journey to the ark, saying that after three days they reached Noah's ark, which had been broken into several pieces by an earthquake and was lying on its side. Davis also reported seeing artifacts, including oil lamps, ancient tools, and even dried beans and jars still full of honey, all of which had fallen out of the ark and been collected and put in a cave in order to protect them from being defiled by outsiders. Heavy snowfall forced Davis and the Abas family to leave the mountain the next day without further exploring the ark. People regard the Davis account with suspicion for several reasons. First of all, Davis states that he could see Mt. Ararat from where he was stationed in Hamadan, located 400 miles away from Mt. Ararat. He then claimed that he and the Abas family traversed the entire distance to the mountain in half a day. Both of these claims are nearly impossible. Davis corrected his story several times after being told that his facts did not line up. When subjected to a lie detector test, he faltered at the question: "Are you lying when you state that no one ever told you about the Ark other than Abbas and the Bible?" He initially responded in the negative but acknowledged that he had discussed the topic with other people. Some speculate that, while Davis probably was taken to a mountain and shown what he believed to be Noah's ark, it may have actually been another mountain, such as Kuh e Alvand. Many natives to the area believe that the ark came to rest on Kuh e Alvand, located only 60 miles from Hamadan, rather than on Mt. Ararat. While the truth of Ed Davis story remains in question, his firsthand account of seeing the ark has served as an inspiration to many other ark researchers, including Ray Anderson and Robert Cornuke. In 1955, Fernand Navarra climbed up to the Parrot Glacier (named for Friedrich Parrot) on Mt. Ararat with his son Raphael. They found several pieces of petrified wood in a crevice and removed a 5-foot-long wooden beam which they brought back with them. The wood was subjected to Carbon-14 dating by five different laboratories, with results placing the age of the wood between 260 and 790 A.D. Various other less reliable methods of dating showed the wood to be around 5000 years old. Furthermore, Navarra's truthfulness was called into question when other members of his expedition claimed that Navarra purchased old wood and planted it on the site. The SEARCH (Scientific Exploration and Archaeological Research Foundation) group formed in the 1960s and began searching for the ark based on Navarra's story. They looked in the ice where Navarra dug up his petrified timber but found nothing. Navarra, after disappearing for a day, led the SEARCH group to a new location. Subsequently, they dug up five samples of petrified wood which were carbon-dated at 600 to 1700 years old. Such convenient coincidences concerning Navarra reinforced the opinion that he had planted the samples on the mountain. In the 1930s, Eryl Cummings began gathering information from various people who claimed to have seen or been to Noah's ark. Using their descriptions, he began searching for Noah's ark on Mt. Ararat. He made several expeditions to the mountain in the 1970s and in 1972 his wife, Violet Cummings, published the book Has Anybody Really Seen Noah's Ark? on the subject. During his expedition in 1972, Eryl Cummings took aerial photography of Mt. Ararat, which other ark searchers later examined thoroughly. After going over the photos, some of Cummings' associates claimed to see what they thought were several pieces of the ark, but the alleged pieces were never positively identified. Ray Anderson joined several expeditions to Ararat in the 1970s. He worked closely with other well-known ark researchers, including Eryl Cummings, Lawrence Hewitt, James Irwin, and Ed Davis. Ray Anderson also spent time closely examining the hundreds of pictures taken on his expeditions, hoping to find some sign of the ark. He also looked at slides from video footage of the mountain taken by Chuck Aaron on a helicopter flight around Mt. Ararat's glaciers. Anderson noticed three areas that looked like possible pieces of the ark. He showed them to Ed Davis, who said that he recognized the "fishhook-shaped" formation as the area where he had seen a piece of the ark. Anderson was never able to visit the sites in his pictures because the Turkish government refused to grant permission to search the mountain. Nevertheless, he continued to hope that the ark would one day be discovered. Others cite his pictures as evidence that the ark exists on Mt. Ararat. The three pictures, however, while interesting, are far from conclusive and may turn out to be natural formations rather than pieces of the ark. They can be viewed on Ray Anderson's website, Noah's Ark- Fact Not Fiction. John Morris has made thirteen visits to Mt. Ararat in search of Noah's ark. He went on his first expedition in 1972 along with John Bultema, Roger Losier, John Seiter, and Bill Ellison. When invited to join the Cummings-Irwin group in 1982, Morris formed a separate expedition group sponsored by the Institute for Creation Research (ICR) that would work in conjunction with the Cummings-Irwin group. After allowing the Cummings-Irwin group to explore the mountain, however, Turkish officials were reluctant to let another group in. Therefore, the ICR expedition was delayed and was unable to join the Cummings-Irwin group. On his many expeditions, Dr. Morris and his associates took thousands of pictures of Mt. Ararat, both from on foot and from the air. Helicopters were often used to take pictures, when weather and the Turkish government permitted it. Several times, the searchers noticed mysterious "boat-like" objects that might have been the ark, but after further inspection, the objects turned out to be natural formations. Expeditions have dug down into the glacier on Ararat in search of the ark and have used scientific equipment to search for objects hidden in the ice, but no signs of the ark were uncovered. Morris continues to hope that the ark may be preserved somewhere on Ararat or in the vicinity, and a large portion of the mountain remains to be searched. Noah's Ark the Search Goes On by John D. Morris, Ph.D., Acts & Facts, Feb 1, 1983. A Report on the ICR Ararat Expedition, 1987 by John D. Morris, Ph.D., Acts & Facts, Jan 1, 1988. The Search for Noah's Ark: Status 1992 by John D. Morris, Ph.D., Acts & Facts, Sep 1, 1992. Progress In The Ark Search by John D. Morris, Ph.D., Acts & Facts, Feb 1, 2002. Ron Wyatt, a former nurse anesthesiologist, maintains that the ark rests not on top of Mt. Ararat but in nearby Dogubayazit in eastern Turkey. The site, known as the Durupinar site, was first photographed by a Turkish Air Force pilot in 1959, and the strange formation was further investigated by the Archaeological Research Foundation (ARF) in 1960, at which time they determined that the Durupinar site was merely an interesting geological phenomenon arising from purely natural causes and was not, after all, the remains of Noah's ark. No further interest in the Durupinar site was shown until Ron Wyatt began searching it for remains of Noah's ark. He first visited Turkey in 1977 and again in 1979. In 1984 he returned, along with James Irwin, John Morris, and Marvin Steffins. David Fasold and John Baumgardner also accompanied Ron Wyatt on some of his expeditions. Although the men who investigated the Durupinar site with Wyatt originally thought that it held some promise of being the landing site of Noah's ark, all but Wyatt and Fasold changed their views once a thorough examination of the area was made. Among the evidence Wyatt claims to have found are: stone anchors with eight crosses representing Noah's family, petrified wood samples from the ark, preserved animal parts, and metal braces. Andrew Snelling of Answers in Genesis'' argues that the purported drogue stones (anchor stones) show no signs of wear, such as would be the case if they had been attached to the ark by ropes. He notes that the holes in the stones are too close to the edge, meaning that the weight of the stone would cause the end to snap off. Additionally, not all of the stones have eight crosses carved into them. In actuality, some have three while others have twenty. Snelling also observes that God was directing every step of the ark-building process; Noah and his family relied solely on God for protection and guidance. God even shut the door to the ark. Therefore, since no mention of anchor stones is made in the detailed guidelines God gave Noah for building the ark, it is unlikely that they would have been added and their presence would seem out of place because they would give Noah a way to guide the ark. With regards to the petrified wood, Snelling states that no scientist who has visited the Durupinar site has seen any petrified wood other than trace fragments which likely flowing into the area with a mudflow. The samples Wyatt and his associates display were reportedly analyzed by Galbraith Laboratories of Tennessee and identified as petrified wood, but the laboratory maintains that they were not able to form an opinion on the sample from the tests taken. When asked to provide a thin section of the petrified wood for verification, Roberts refused to comply. Although the pieces of petrified animal hair and antlers (actually, it is only an antler tip) may be what Wyatt and Roberts claim they are, the specimens were found near the surface, not withing the boat formation, and were likely left behind by some of the many animals that can frequently be found in the area. Wyatt claims that metal detector tests found evidence of metal braces in the boat-formation. Furthermore, he says that they were able to map out the lines between the braces and that they were found in regular intervals. However, Bill Crouse points out that the devices used to search the area were not scientific instruments but included devices like the "molecular frequency generator", on the same level of accuracy as a divining rod. While metal deposits were found, they were nothing exotic to the area. Rather, the samples taken contained oxides, ores, and metallic compounds that would naturally occur in volcanic soil. Most in the scientific community regard Wyatt's ark as a natural phenomenon. Baumgardner and geologist Salih Bayraktutan took surveys of the site and drilled 10 meters into the formation in 1987 and 1988. After a thorough investigation of the area, they concluded that the boat-shaped formation was an outcropping of limestone with numerous basalt boulders. 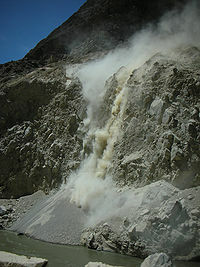 Mudflows, which frequently occur on the mountain, would flow around such an outcropping and eventually form an almond-shaped (or boat-shaped) structure. Since their initial expeditions, both Baumgardner and Fasold have parted ways with Ron Wyatt. Fasold came to the conclusion that the site does not actually contain the remains of Noah's ark, and Baumgardner holds that the site is no more than a naturally occurring formation.. Falling rocks, such as the one that struck and badly injured James Irwin, are one of the many dangers that searchers have to watch out for. In August of 1982, Eryl Cummings joined with former astronaut James Irwin to search for the ark. Irwin, due to his small acquaintance with the president of Turkey, was able to obtain a permit to search in the area around Mr. Ararat. They searched in an area known as the North Canyon, but did not find the ark. No other areas were searched because of a lack of experienced climbers and explorers in the group. Irwin also sustained a severe injury after being hit in the head by a falling rock, making it necessary for him to cut his expedition short. A violent storm forced the group to call off a previously planned aerial search as well. After speaking with a Turkish traveler who claimed to have seen the ark in 1980 and again in 1982, Irwin decided to revisit the mountain in September and attempt to complete an aerial search. Irwin was injured again, and the group was not permitted to perform the desired aerial search. Some of the members of Irwin's group returned to Ararat a third time in late October. Although the snowfall was too heavy to permit climbing at that time, they viewed what they thought might be the ark through a telescope. However, after studying the object they determined that it was, in fact, not Noah's ark. Irwin returned to Mt. Ararat four other times in search of the ark and made an aerial survey of the terrain, but without success. He wrote More Than an Ark on Ararat about his experiences (published in 1985) and passed away in 1991. Bill Crouse went to Mt. Ararat twice, once in 1984 and again in 1985, to look for the remains of the ark. He wrote numerous articles on the search for Noah's ark, reported discoveries, and possible locations of the ark. His articles have been published in Acts and Facts, Archeology and Biblical Research, and Technical Journal. He also served as the editor of Ararat Report, a newsletter on events concerning the Noah's ark search, from 1986 to 1993. Crouse visited Armenia in 1989 and was allowed to see relics from Noah's ark at the monastery in Echmiadzin. Robert Cornuke, founder of the BASE (Biblical Archaeology Search and Exploration) institute dedicated to finding biblical artifacts, first journeyed to Turkey with Jim Irwin in 1986, but they were arrested by Turkish authorities and denied permission to search on Ararat. The group returned the next year, in August of 1987, and conducted a brief aerial search of the mountain. In 1988 a third attempt was made to search Mt. Ararat, with Chuck Aaron flying the helicopter. They visited as many potential sites as they could before exhausting their fuel supply, but with no success. Discouraged, Cornuke did not make another attempt to search for Noah's ark until 1998, when he received a phone call and was told to take a second look at Genesis 11:1-2, which says that Noah's sons traveled from the east to the land of Shinar (present-day Iraq) after the flood. This brought Cornuke to the conclusion that the ark was not located in Turkey but east of Iraq, in Iran. He decided to search in the Zagros Mountains, located on Iran's border with Iraq, and made an expedition there in 1998, but again experienced little success. In 1999, Cornuke was persuaded by other searchers who believed they had pictures showing the ark's location to revisit Mt. Ararat and examine the Ahora Gorge, but they found only a large rock protruding from the ice. Robert Cornuke made several more trips to Iran and even went back to Ararat again. In 2005, while searching Mt. Soleiman in Iran for traces of the ark, Cornuke's team found pieces of petrified wood and possible pottery shards, which they brought back with them to be tested. While still uncertain whether the objects were once part of Noah's ark, Cornuke and his team remain hopeful that someday the ark will be discovered and proven to exist. A documentary was made of Robert Conuke's expeditions to search for the ark. See Search for Noah's Ark: The Lost Mountains of Noah. Chuck Aaron was selected to join Jim Irwin's 1987 ark search because of his experience as a helicopter pilot. The 1987 expedition did not reach their desired site for investigation because of conflict between Turkey and Russia over border issues. Aaron returned to Ararat nine other times. In 1989 he carried out an exploration of the Ahora Gorge. On various other expeditions he has organized, Aaron took video footage and photographs from his helicopter. Sonar readings were taken of the western side of the mountain, but they showed no signs of the ark. Don Shockey made his first trip to Turkey in 1984 along with Howard Davis and others. No traces of the ark were found on that expedition. Since then, Shockey made nine more trips to Turkey and climbed Mt. Ararat three times. He also organized the only "ark-a-thon" in New Mexico in 1986, which was a collaboration by many of the explorers and researchers involved in searching for the ark. Shockey later met George Stephen, claimed he had access to satellite imaging on any area in the world. He agreed to look at Mt. Ararat for Shockey and marked on a map two spots where he believed he saw objects that appeared man-made. Both the locations were in the Abich II glacier, and Shockey quickly organized an expedition to the area only a month later, in July of 1989. Guided by Ahmet Arslan and another Turkish man, Don Shockey ascended Ararat as far as he was allowed to go, after which he had to send the Turkish guides on alone to find and photograph the objects that George Stephen had seen. Arslan (a man of dubious reputation) announced that he had seen the ark, but the pictures alone were not enough proof. Therefore, Shockey organized another venture for 1990. He and eight other men rented a helicopter to survey the mountain from above and planned to climb to the site in question to examine it. Unfortunately, the Turkish government would only let three team members land and climb on the mountain. When fighting between Kurdish terrorists and the Turkish military broke out on the mountain, the three climbers were forced to abandon their mission as well, never having reached the site with the potential Noah's ark. Picture of the Ararat anomaly taken by the US Defense Intelligence Agency in 1949. Daniel McGivern, a Roman Catholic businessman from Hawaii, announced in 2004 that he had discovered what was almost certainly Noah's ark. In 2003, after seeing satellite images released by the United States government in 1997 of a mysterious dark spot on Mt. Ararat, he hired DigitalGlobe to take pictures of Mt. Ararat using their Quick Bird satellite. That year there were record high temperatures in Europe, causing large amounts of ice to melt on Mt. Ararat and revealing the dark spot, termed the "Ararat Anomaly". McGivern claimed that his new photographs of the spot showed what appeared to be crossbeams of a boat, and announced that he would be taking an expedition of to Ararat, led by Ahmet Ali Arslan, a Turkish scholar who claimed to have climbed the mountain 50 times in 40 years. McGivern hoped to find the ark, enter it, and take more photographs. All the publicity, however, failed to convince Turkish authorities to grant the expedition permission to access the mountain, and McGivern's plans were never fulfilled. ↑ 1.0 1.1 1.2 1.3 1.4 Ark Fever by Robert Cornuke. Illinois: Tyndale House Publishers, Inc., 2005. ↑ 2.0 2.1 2.2 Mt. Ararat The Genesis Files Web Site, 2/19/2006. ↑ 3.0 3.1 3.2 Mount Ararat: Dangers/Problems by Matthew Kneisler, The Search for Noah's Ark, 2007. ↑ Journey to Ararat by Friedrich Parrot, translated by W.D. Cooley, New York: Harper and Brother's Publishers, Franklin Square, 1859. pages 166-176,186-209. ↑ 5.0 5.1 Ancient relics bring 'healing' to Kurds: Artifacts linked to Noah's Ark claim miraculous powers by Anthony LoBaido, WorldNetDaily.com, Dec. 24, 2000. ↑ 7.0 7.1 Evangelicals and science in historical perspective edited by David N. Livingstone, Darryl G. Hart, Mark A. Noll. pages 244-261. New York: Oxford University Press, Inc., 1999. ↑ Ed Davis's Visit To Noah's Ark by Mexico Beach Christian Worship Center. ↑ Ed Davis: Ararat adventure and Ark sighting as told to Robin Simmons by Ed Davis, NoahsArkSearch.com. ↑ Figment or Fact? : The Incredible Discovery of Noah's Ark by Bill Crouse, Ararat Report #32, May 1993. ↑ The Search for Noah's Ark by Kelly L. Segraves, online book, The Parent Company. ↑ Index to Creationist Claims: Claim CH504.2 edited by Mark Isaak, 7-5-2003, The Talk Origins Archive. ↑ Noah and the Great Flood by Robert D. Mock MD, 1998. ↑ Noah's Ark has been found, but not totally confirmed. ↑ Noah's Ark- Fact Not Fiction by Ray Anderson and family. ↑ An Ararat Reunion by John D. Morris, Ph.D., Acts & Facts, Aug 1, 2003. ↑ 18.0 18.1 18.2 18.3 18.4 Noah's Ark the Search Goes On by John D. Morris, Ph.D., Acts & Facts, Feb 1, 1983. ↑ Noah's Ark and the Ararat Adventure by John D. Morris, Arizona: Master Books, eighth printing: October 2006. ↑ 20.0 20.1 20.2 Ron Wyatt: Are His Claims Bonafide? by Bill Crouse, NoahsArkSearch.com, May-June, 1988. Number 17. ↑ 21.0 21.1 21.2 21.3 Special report: Amazing ‘Ark’ exposé by Andrew Snelling, September 1992, Answers in Genesis. ↑ Bogus "Noah's Ark" from Turkey Exposed as a Common Geologic Structure by Lorence Gene Collins an David Franklin Fasold, published in the Journal of Geosciences Education, v. 44, 1996, p. 439-444. ↑ Letter from John Baumgardner: Regarding the Claims of Ron Wyatt by John Baumgardner, September 26, 1996. ↑ 24.0 24.1 Chapter 22: 1984-2009 Bill Crouse by Bill Crouse, edited by Rex Geissler & B.J. Corbin. Chapter 22, The Explorers Of Ararat: And the Search for Noah's Ark, 3rd Edition, Online Version, Great Commission Illustrated Books. ↑ Search For Noah's Art by Christian Information Ministries. ↑ Noah's Ark Discovered in Iran? by Kate Ravilious for National Geographic News, July 5, 2006. ↑ Chapter 27: 1988-1993 Chuck Aaron edited by Rex Geissler & B.J. Corbin. Chapter 27, The Explorers Of Ararat: And the Search for Noah's Ark, 3rd Edition, Online Version, Great Commission Illustrated Books. ↑ Has Noah's Ark Been Found? by Editor Bill Crouse, Ararat Report, January 1990, Number 23. ↑ 1984-1990 Don Shockey, O.D. by Don Shockey, edited by Rex Geissler & B.J. Corbin. Chapter 13, The Explorers Of Ararat: And the Search for Noah's Ark, 3rd Edition, Online Version, Great Commission Illustrated Books. ↑ Noah's Ark Quest Dead in Water -- Was It a Stunt? by Stefan Lovgren for National Geographic News, September 20, 2004. ↑ Explorers of Noah's Lost Ark by Gordon Govier, Christianity Today Magazine, 7/1/2004. ↑ Satellite photos spark Noah's Ark trek by WorldNetDaily.com, April 27, 2004. Noah's Ark: Status 1975 by John D. Morris, Ph.D., Institue for Creation Research. Noah's Ark Goes to Hollywood by John D. Morris, Ph.D., Institute for Creation Research. The Search for Noah's Ark: Status 1992 by John D. Morris, Ph.D., Institute for Creation Research. The Return Of Noah's Ark by John D. Morris, Ph.D., Institute for Creation Research. Noah's Ark Remains In The News by John D. Morris, Ph.D., Institute for Creation Research. Has Noah's Ark Been Discovered? by John D. Morris, Ph.D., Institute for Creation Research. Noah's Ark and the Genesis Flood: Part 2 by Endtime Prophecy Net, published 4/22/1997, updated 4/8/2009. Noah's Ark Found? Turkey Expedition Planned for Summer Hillary Mayell, April 27, 2004. Noah's Ark Found! Again? by Bill Crouse, 5/8/2004, Vol.2, #15. Noah's Ark: Its Final Berth by Bill Crouse, Rapid Response Report, Christian Information Ministries. Let us Reason - The Unsinkable Search for Noah's Ark by Hugh Ross, Reasons to Believe. Mt. Ararat: Expeditions Past/Present by Matthew Kneisler. The Explorers Of Ararat: And the Search for Noah's Ark Book Initiated by B.J. Corbin, Edited by Rex Geissler & B.J. Corbin, and Co-Authored by 33 Expedition Leaders & Researchers. 3rd Edition, Online Version, 2009, Noah'sArkSearch.com. That boat-shaped rock … is it Noah’s Ark? by John D. Morris, Ph.D., creation.com, Creation Ministries International. First published: Creation 12(4):16–19, September 1990. Ron Wyatt: Are his Claims Bonafide? by Christian Information Ministries, May-June, 1988. Number 17. Figment or Fact? The Incredible Discovery of Noah's Ark by Christian Information Ministries, Ararat Report #32, May 1993. Explorers plan quest in search of Noah's Ark by Hope Yen, Associated Press, April 27, 2004, MSNBC. Has Anyone Discovered Noah's Ark? by Gary Byers MA, Associates for Biblical Research, May 21, 2008. Did the BASE Institute Discover Noah’s Ark in Iran? by Gordon Franz MA, Associates for Biblical Research, Feb 16, 2007. Noah's Ark in Iran? by Rick Lanser, MDiv, Associates for Biblical Research, July 19, 2006. Mount Cudi— True Mountain of Noah’s Ark (PDF) by Bill Crouse and Gordon Franz, Bible and Spade, Fall 2006, Vol. 19, No. 4: 99-111. Associates for Biblical Research. Wood Remains from the "Landing Site of Noah's Ark" Nearly 6500 Years Old (PDF) by Friedrich Bender, Reprinted by permission from UMSCHAU-Kurzberichte aus Wissenschaft und Technik, vol.72, no. 1.Translated from the original German by W. Pasedag, ABR., published in Bible and Spade, Fall 2006, Vol.19, No.4: 112-113. Associates for Biblical Research. The Case for Ararat (PDF) by Richard Lanser, Bible and Spade, Fall 2006, Vol. 19, No. 4: 114-118. Associates for Biblical Research. Arks on Ararat Editor Bill Crouse and Managing Editor Fred Reed, Ararat Report, Feb-Mar 1990, Number 24, Christian Information Ministries, International. The Search for Noah's Ark (Critique of 2008 Video Tape produced by the BASE Institute of Colorado Springs, CO. $14.95.) A review and critique by Gordon Franz, Bill Crouse, and Rex Geissler, December 12, 2008. Christian Evidences: The Historical Evidence for Noah's Ark by Richard M. Riss, December 9, 1996. CIA Releases New 'Noah's Ark' Documents by Timothy W. Maier, Nov. 13, 2002. This page was last modified on 22 April 2015, at 11:46.